The latest fix finally lands on Xbox Live. We PC users have been smugly enjoying a bug-free Skyrim for a week now. Well, maybe not bug-free but patch 1.3 cleaned up a lot of the nagging issues that many people had with the game including magic resistances not working and bookshelves populating as they should. Bethesda said they submitted the patch code to Microsoft and Sony 7 days ago, and, according to a short Tweet, it looks like the 1.3 update was just approved and uploaded by Microsoft as of 7:37am this morning. 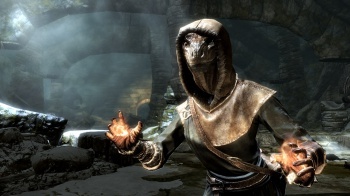 When you boot up Skyrim today on your Xbox 360, the game should update automatically, but there's no indication on when PS3 users will get Patch 1.3 to fix those pesky backwards-flying dragons. "1.3 update now on Xbox LIVE," read the Tweet from Bethesda. Lets get a show of hands of how many people are going to turn on their console as soon as they get home from school/work to get that update cooking? *too many to count* That's what I thought. And for you PC users who have been playing with this patch already and looking down upon your console brethren, take a look at my latest list of mods you can download to feel even more superior.